Sorry for not being active for the last weeks, but I am here now with a great easy and delicious recipe. This recipe works well as an appetizer or impressive side dish. Remove the stems from the portobello mushrooms and finely chop. 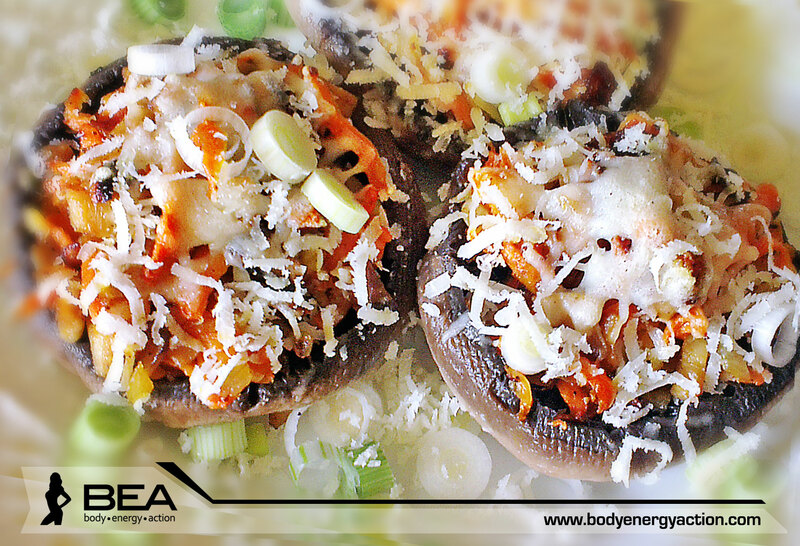 Combine 1/2 teaspoon olive oil, lemon juice, and soy sauce in a small bowl; brush over both sides of mushroom caps. Place the mushroom caps, stem sides down, on grill rack and grill on each side until soft. Heat the olive oil in a large sauté pan. Add the onions, red pepper, carrot and salt. Cook until tender. Add in the tomatoes, garlic and the fresh grounded pepper. Stuff the mushroom caps with the vegetable mixture. Bake them for 10 minutes. Sprinkle on some parmesan cheese and your lunch/ appetizer is ready. looks very very good! you make everything look nice!